Discover Skagway's spectacular natural splendors as you embark on a scenic cruise through Alaskan waters, spot wildlife, and canoe to the face of Davidson Glacier. Relax on an enclosed boat with complimentary lunch and panoramic windows, ideal for seeing whales. Land on Glacier Point, where you'll begin a paddling adventure through placid lake waters to the massive face of Davidson Glacier. Hike up the valley icecap, admiring its towering granite walls and bright blue ice. • Davidson Glacier: Trek across the magnificent icecap, where you'll be awed by its bright blue ice and surrounding granite walls. • Scenic Cruise: Set sail on a comfortable enclosed boat, where you'll enjoy lunch, spectacular coastal scenery, and potential wildlife sightings. 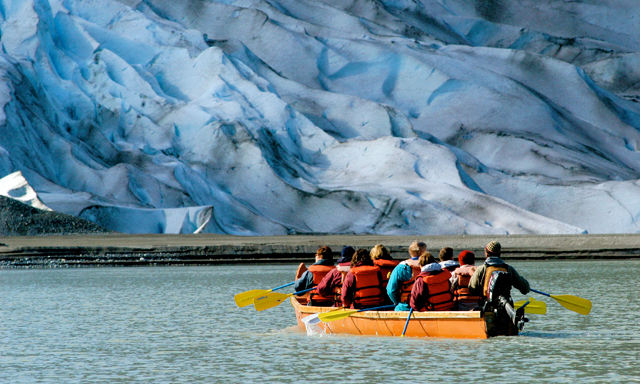 • Canoeing: Board a 31-foot voyager canoe and paddle through calm alpine lake waters to the impressive face of the glacier. • Guests must be able to walk over uneven terrain. • A box lunch is served onboard the boat. • Participants must be at least 7 years old and weigh between 50 and 350 pounds.